Ghoramara Island is located ca. 150 km south of Kolkata, Bay of Bengal, India, in the Sundarban Delta complex. This sparsely populated island is suffering from severe coastal erosion and areal reduction for the last three decades, which results in the loss of major areas on the northwest coast. Both numerous households and a significant area of agricultural land and coastal stretches for fish drying have been lost. This has rendered thousands of people homeless as ‘environmental refugess’. In the present paper an attempt is made to study the erosion and accretion process through time series analysis using a GIS technique. 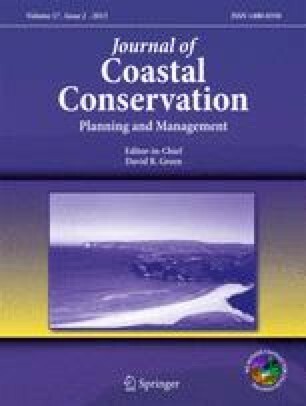 Also, a study of remedial measures to protect the island using a ‘bio-engineering’ technique is reported in this paper. It has been shown that, in the absence of protection measures, the eastern shore will merge with the Indian mainland during the next 25 years, while the western part will be completely washed off.